Now that we know how to make the vinegar sauces for sunomono, let's turn our attention to the prepping of the vegetables. The key to good sunomono, and all aemono (mixed-vegetable dishes), is to use vegetables that have had the excess moisture removed. The way to do this is to either drain them well, salt them lightly to draw out the moisture, or to blanch them briefly. Here are some ways to prep vegetables for sunomono. The recipes for the the vinegar sauces (--su or --zu) mentioned are in Part 1. 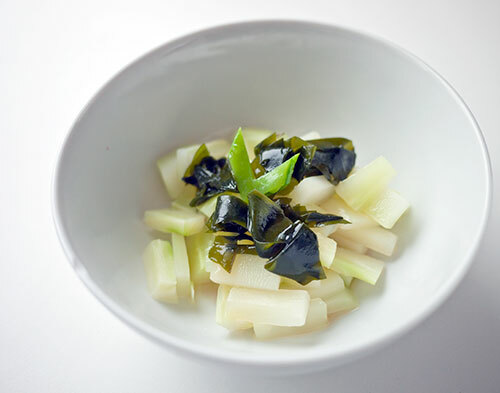 Wakame is one of the easiest sea vegetables or seaweed to work with. I've been trying to eat more wakame recently since it is packed with minerals, so I'm just going to include it in all the sunomono variations below. It can also be used in miso soup, as I showed in Lesson 1a. Wakame comes either in dehydrated form or 'raw' and preserved in salt. If you have the latter kind, simply rinse it well in running water, then soak for a few minutes in a bowl of fresh water. If you have the dehydrated kind, soak in plenty of water to cover until it's rehydrated. Either way, it should look like this after a while. The dehydrated kind usually comes pre-cut into pieces but the salted kind comes in long pieces like so. Just cut it up into small, bitesize pieces. Here's about 1/2 cup of ready to go wakame, which can be used in sunomono, soups, salads and so forth. 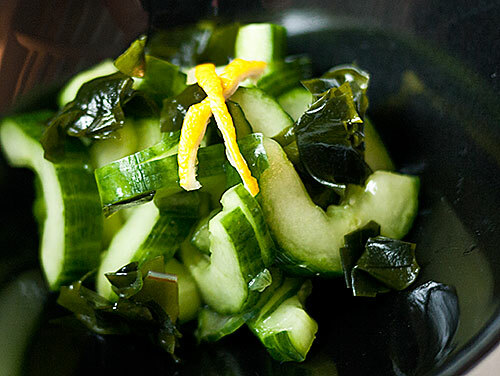 Cucumber is one of the most versatile vegetables for sunomono. It's available year-round (although its real season is summer), and its crunchy-crisp texture lends itself well to vinegar sauce. Japanese cucumbers are quite small and narrow, but just about impossible to get outside of Japan, so I usually use the type of cucumber that's called an English cucumber - long, and sometimes sold individually shrinkwrapped. Since cucumbers have a high water content we need to remove some of that. 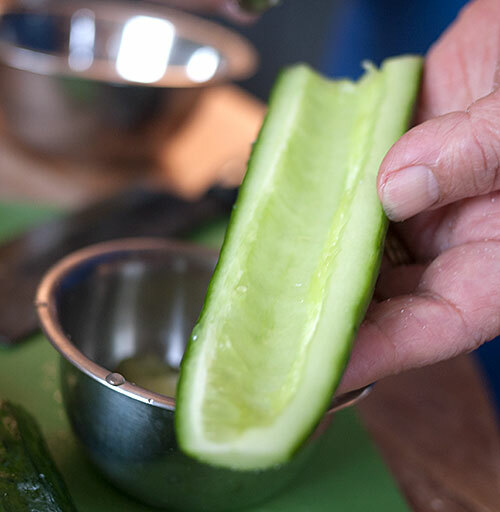 Cut the cucumber in half lengthwise, and rub the surface with a little salt. This adds salt flavor, draws out excess moisture, and also makes the dark green skin really pop in color. 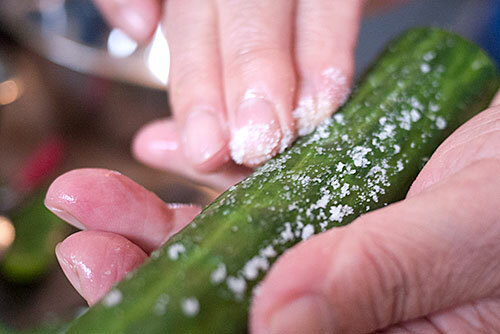 Plus, if you have very fresh cucumbers with sharp little thorns, the salt will rub those off. Cut up the cucumber into fairly thin slices. Sometimes I like to slice it paper-thin, and sometimes I slice it a bit thicker as I have here. 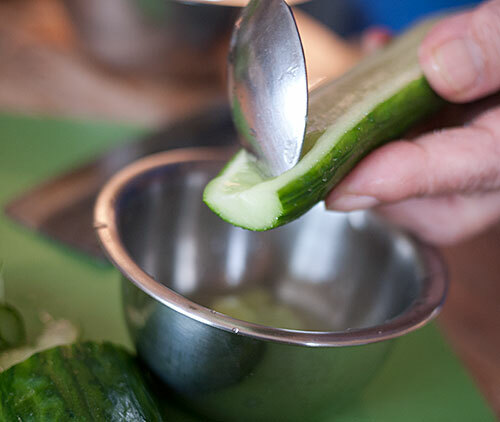 Massage the cucumber to distribute the salt, then squeeze out as much excess moisture as you can. Cucumber sunomono lends itself to any kind of awase-zu, but I especially like it with the citrusy flavor of ponzu. I used the Ultra Simple version of ponzu here and it was great. Use 1 to 1 1/2 tablespoons of sauce per cup of vegetables, or to taste. Not all turnips are suitable for using uncooked like this, but small turnips work very well. 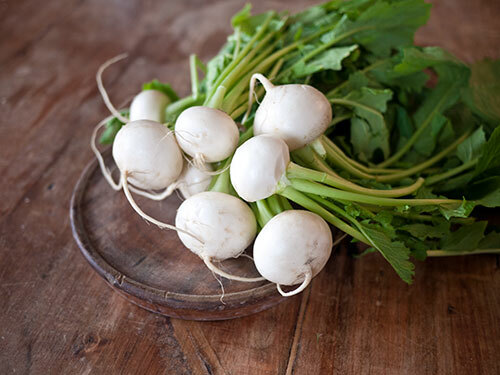 These little white turnips are perfect. If you can get turnips with their green tops still on, cut the greens off to leave a little bit on the root. (Use the greens for making homemade furikake.) 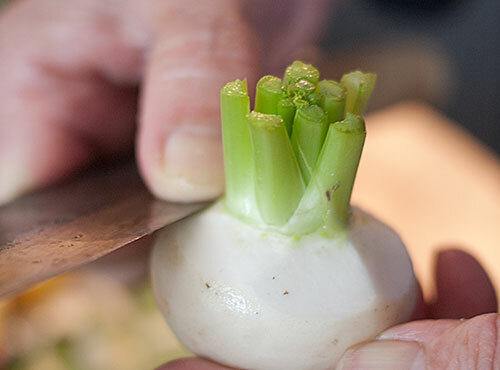 Carefully peel the turnips so you leave that little green topknot intact. Tip: The outer part of some kinds of turnips (like these white ones) is rather tough and fibrous, so you should peel them rather thickly. I know it seems wasteful, but the turnips will be a lot more edible. Then slice the turnips lengthwise, so you have a bit of that green with each slice (except for the sides). 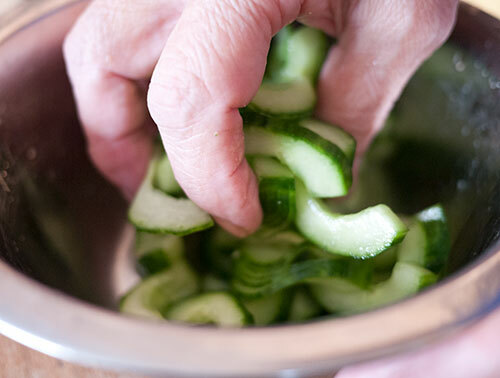 Sprinkle the slices with a tiny bit of salt, massage as with the cucumber, and squeeze out tightly to express any extra moisture. The sweetness of sanbai-zu brings out the sweetness in the turnips. This is just as good without the wakame. Use 1 to 1 1/2 tablespoons of sauce per cup of vegetables, or to taste. Tip: cutting the turnips with the green tops on makes the slices very attractive in miso soup too. This is a very frugal dish, making use of a part of broccoli that most people just throw away. To prep the broccoli stems, cut off the florets (to use for another dish). Peel the tough green outer parts of the stems, and cut them into bitesize pieces. Blanch the pieces in boiling water for about 2-3 minutes until crisp-tender, drain and cool. The umami-rich flavor of tosa-zu goes very well with broccoli and wakame. You can add one broccoli floret as a green accent, or use another green accent like the snap pea piece I've used here. Use 1 to 1 1/2 tablespoons of sauce per cup of vegetables, or to taste. What other vegetables can you use? 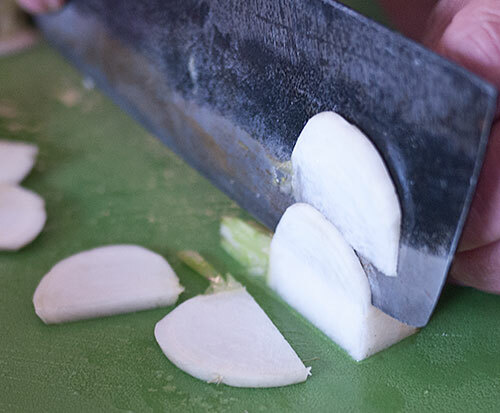 Daikon radish: Slice thinly, salt and squeeze out. Radishes: Slice thinly or into halves or quarters, salt and squeeze out. Cabbage: Cut up roughly, salt and squeeze out. Tomatoes: De-seed and get rid of the pulp. Drain in a sieve to let any excess moisture run off. Celery: Peel off the tough outer fibers of the stalks. Slice very thinly, and sprinkle with a tiny of salt and squeeze out. Celery works well with sanbai-zu or ama-zu. Mizuna: Blanch in plenty of boiling water, cool in cold water and squeeze out tightly. Cut into short lengths. Mizuna goes well with any of the sauces, but I like it best with simple nihai-zu or ponzu. Edible chrysanthemum flowers: Blanch briefly in boiling water and drain. 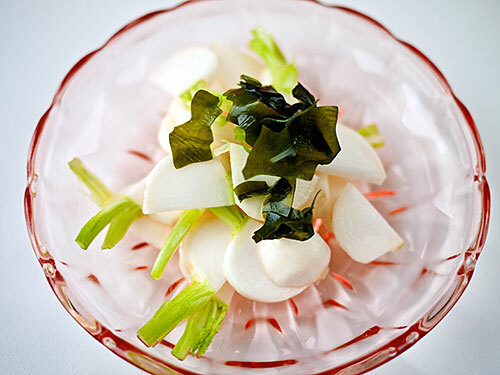 This is used most often together with other vegetables, such as daikon radish, and is really pretty. A few vegetables may not be so suited to vinegar flavor (brussel sprouts come to mind for one) but that's really a matter of taste. I hope you'll try out your favorite vegetables as sunomono and see how they turn out. Boiled seafood such as boiled shrimp, octopus and squid are often used in sunomono. Boiled shrimp is easy to do at home. If you want to try octopus, buy a piece of sashimi-ready octopus at a Japanese grocery store. (Raw octopus needs to be massaged and beaten up to make it tender enough before boiling.) Poached chicken also works well, especially with nanban-su. You can find dehydrated seaweed salad mixes at Japanese or Korean grocery stores. 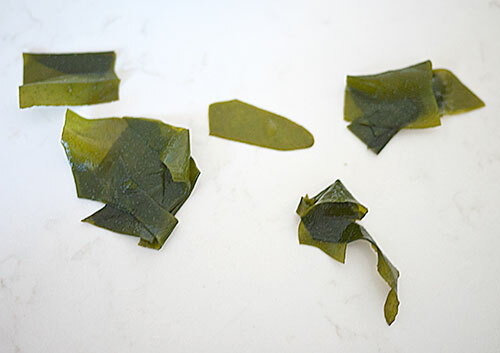 To use these just soak in water as for the wakame until they are rehydrated and pliable. Use any of the vinegar sauces - for a Korean twist, add a bit of sesame oil and grated garlic. 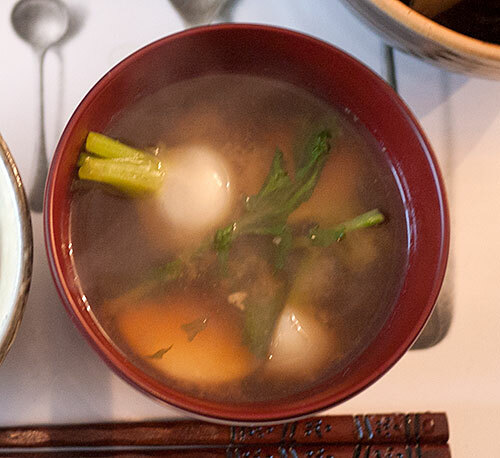 Harusame is a noodle made from potato starch that is used in sunomono. It requires special treatment so I'll post a separate recipe with it at a later date. If you think about it, sunomono sauces are rather like oil-free dressings, so they can be used with any number of salad-like combinations. The oil-free dressings sold in Japan are actually just variations on sunomono sauces. I hope you've enjoyed this trip through sourness. In the next lesson we'll finally get to the main protein dish of a Japanese meal. Submitted by maki on 2013-04-04 16:52. Thank you, Maki san, for such wonderful series. I have one question about the wakame. After it is rehydrated, do I need to boil it or blanch it? Or, it can be eaten as is? 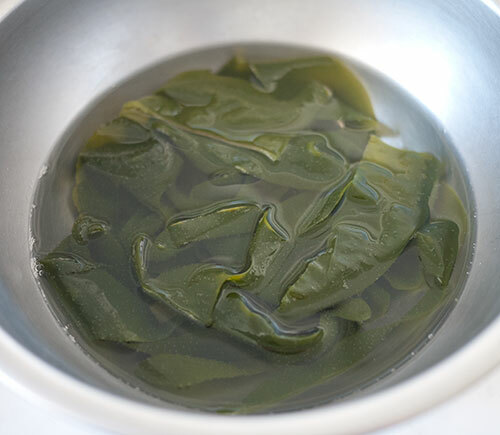 If I'm using only wakame as my sunomono, how much vinegar should I use per cup of hydrated wakame? Which type would you recommend? Thank you so much! 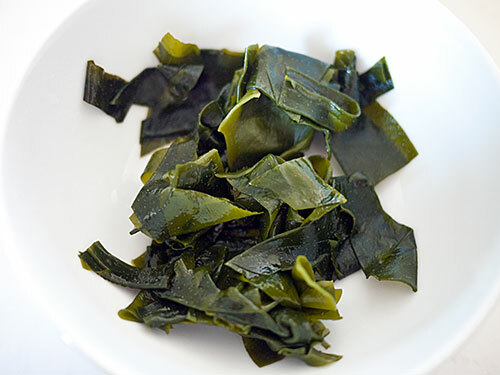 Wakame does not need to be blanched - it will get too soft to use in a salad if you boil it. Just rehydrate it and it's good to go. If you're using wakame only* for a sunomono I'd start with a bit less than 1 Tbs. per cup, taste and add more as needed. I like a non-sweet sauce like awase-zu or ponzu with wakame. Keep in mind that wakame is a bit salty since it comes from the sea. Thank you so very much for all the work you are putting into this class. I'm not a creative cook and so appreciate the tips and suggestions (ie, different veggies, different sauces that compliment). I'm grateful for the photos as well, because my spinach tamagoyaki never resembled the pretty cover shot!! so it was nice to know I didn't od it wrong, just needed to cut it pretty for serving. Thank you again, I am really enjoying the class. Hi Maki, I've got some Persian cucumbers, which are very tiny and are similar to Japanese cucumbers but only shorter, I think. Do I still need to remove the seeds? Thanks! If there are only a very few small seeds in the middle you don't need to remove them, but if there are a lot you should. This is one of the prettiest dishes I have ever seen. I don't yet know where to get those tiny turnips, but it is ON MY LIST! You shouldn't rinse off the salt since this will make the vegetables watery. Make sure you don't over-salt them to start with. If you do, it's ok to rinse off the excess salt, but try to do this before you squeeze out the veg. Hi Maki, I'm planning on making the wakame and cucumber sunomono for my bento. Can I mix the vegetables and ponzu in the night, refrigerate it and then use it the next morning for my bento? Would the vegetables be too sour and saltish if left overnight? Or should I prepare the ponzu and vegetables the night before and store them separately in the refrigerator then mix them the next morning to use in my bento? If I should mix the ponzu and vegetables only in the morning, do I need to wash the salt off the cucumber before refrigerating? The vegetables should be fine if you leave them overnight, provided you've followed the steps and squeezed out/drained off the excess moisture properly - and not oversalted it in the first place of course! I actually just had some sunomono left over and uh...forgotten in the fridge for a week ^_^; and it was still good. I made this with awaze-zu this evening, and I have a little question about the wakame. I rehydrated some, and drained it in a sieve, but it kind of looked soggy compared to these illustrations. I did leave it to dry a little on a paper towel nut it didn't seem to make a huge difference. Did I do something wrong - should I have salted it, like the cucumber (I was reluctant to since it's a little salty anyway). Or is this just a sideffect of using dried wakame, maybe? (It tasted great by the way - thanks for the recipes)! I had some difficulty with this too at first. 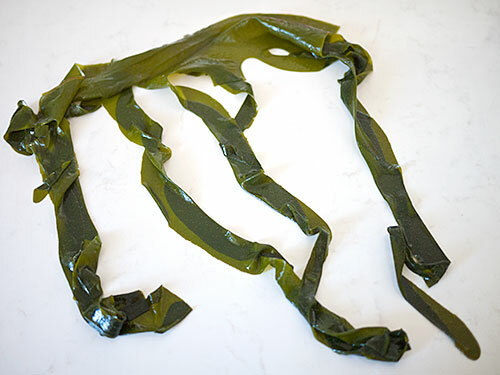 I ended up spreading the wakame out as thinly as I could onto a paper towel, placing another paper towel on top, and rolling the whole thing up like a sushi roll. I rolled it around and twisted and squeezed it until the paper towel was very damp. After unrolling, the wakame inside was substantially drier. A little bit would get smooshed into the paper towel, but it's a small sacrifice, I think. It's not the greenest option either... maybe someone else will have a better solution. In the meantime, this works. Definitely have to try the Broccoli stems and wakame with tosa-zu. Broccoli stems are normally thrown away and if this is as great as it looks, that humble broccoli has just gained more mileage.